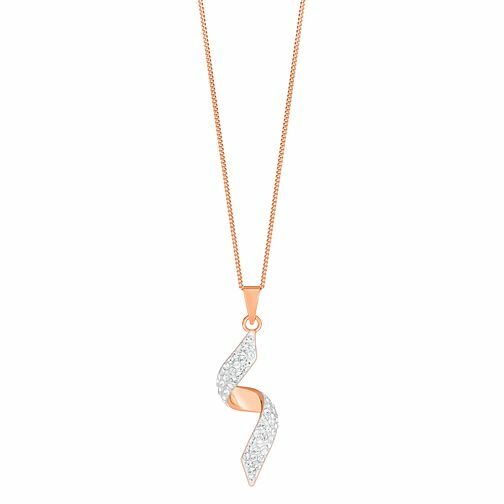 Styled with an elegant twist, this sumptuous rose gold-plated sterling silver pendant is set with sparkling crystals for a glamorous finishing touch. Team with a matching pair of earrings for a coordinated look. Evoke Rose Gold-Plated Crystal Twist Pendant With 18" Chain is rated 4.8 out of 5 by 8. Rated 5 out of 5 by Anonymous from was as described and really nice. had seen this on someone and really admired it. it did not disappoint. Rated 5 out of 5 by Anonymous from Drop necklace Very pleased with necklace which matches earrings I was bought for Christmas.